Sinful Sunday is all about the image, and for once I don’t have the urge to add unnecessary words to this photo. But the quote? It links the utter innocence of the place I perverted by taking my top off to take a photo with the journey I’m mapping through my own sexuality and submission in a way that makes me smile. 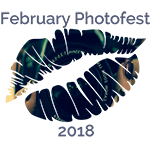 Today’s photo is for both Sinful Sunday and the February Photofest, so there are two sets of lips to kiss so you can see everyone’s fabulous photography.